Dance Marathon Involvement: I have been involved with Dance Marathon programs since my freshman year in high school. During my time at Vanderbilt University, I served as President of VUDM during the 2016-17 academic year (senior year). Prior to my year as president, I served as Co-Director of Dancer Relations during the 2015-16 (junior) academic year. I was Morale committee member in 2014-15 (sophomore) and a Family Relations committee member in 2013-14 (first year). In these four years involved with Vanderbilt University Dance Marathon, I personally fundraised $7,286 for Monroe Carell Jr. Children’s Hospital at Vanderbilt. Post-Graduation Plans: I will be attending Belmont University in the fall for an Accelerated Second-Degree BSN program. I am planning to work as a nurse for a few years (ideally in a NICU or Pediatric Acute Care setting), then go back to Vanderbilt to get my Masters in Nursing. Ultimately, I would like to get a PhD in clinical research in nursing science. I hope to work on research in the Neonatal Intensive Care Unit environment, how to increase positive outcomes for premature infants and their families, and more. My experience with Dance Marathon has been formative and truly life changing. I am so proud that I have been able to leave my mark on Vanderbilt’s campus through Dance Marathon. In my four years with VUDM, we have passed many fundraising milestones, increased on campus engagement, introduced new initiatives like a Dancer Fundraising Minimum and fundraising “push days,” and much more. But the accomplishment I am most proud of is the ability to create an organization that puts on events that our students and Miracle Families are so excited to be part of. This year I worked with our executive board to create a campaign for one of our Miracle Kids that was in the hospital: we called our campaign for support “Courage for Caleb.” The campaign started with a video and social media posts and culminated with us distributing “Courage for Caleb” buttons for students to wear on their backpacks to represent VUDM and Vanderbilt’s support for Caleb and all other patients at our local CMN hospital, Monroe Carell. Walking around campus and seeing the “Courage for Caleb” buttons has been an incredibly powerful reminder that our students rally around Dance Marathon’s inspiring cause. And I am so proud to have inspired students to support our kiddos like Caleb! Additionally, one of the most rewarding parts of leading Dance Marathon has been hearing the feedback from families. Before our Big Event, our families were even participating in our cover photo change as part of our social media push. Knowing that our families are so excited about coming to celebrate with us makes everything so much more exciting! Dance Marathon never feels like a job; it has always been a privilege to work for families at Monroe Carell with VUDM. Detherage with Caleb, a Miracle kid from Monroe Carell. While my time on VUDM’s executive team was somewhat short, it was without a doubt the most formative set of experiences of my time at Vanderbilt. 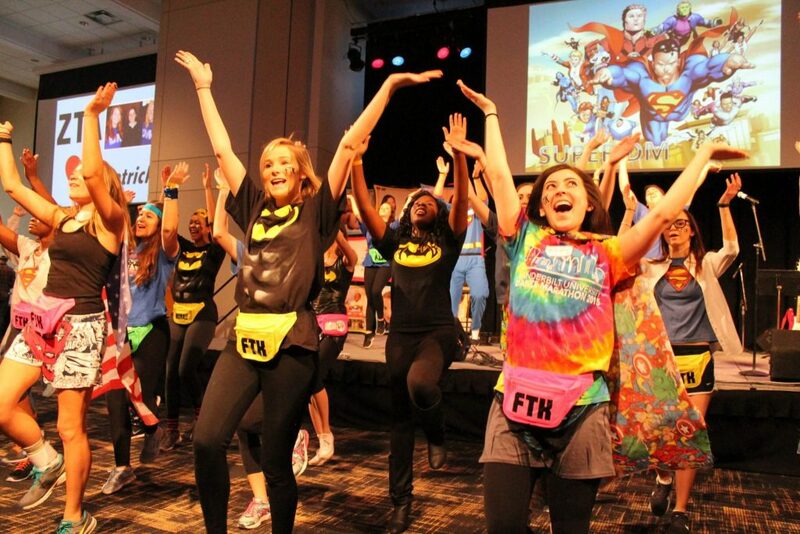 On the surface, Dance Marathon may just seem like another campus organization. However, I can say without a doubt that the high standards that our organization holds itself make us more than just another campus organization. We work tirelessly to represent Miracle Network Dance Marathons well and create an unparalleled experience for our students and Miracle Families alike. My role as President allowed me to learn in so many different fields: I headed PR and learned important branding and marketing skills; I helped our Partnerships directors reach out to our community and learned about effective stewardship; and so much more. I learned the importance of communication: on a large scale, I learned how to effectively relay information to our campus community; on a smaller scale, I learned the importance of maintaining open lines of communication to ensure thorough and effective work. VUDM provide me with the opportunity to create and maintain professional relationships with campus faculty, community partners, and Monroe Carell staff that I am so grateful for. Dance Marathon was not only one of the most rewarding experiences of my college career but arguably also one that provided the most growth for me as a leader and as a person, and I am so grateful for that. I participate in Dance Marathon because I am inspired every day by the students I work with and the families and children I work for. 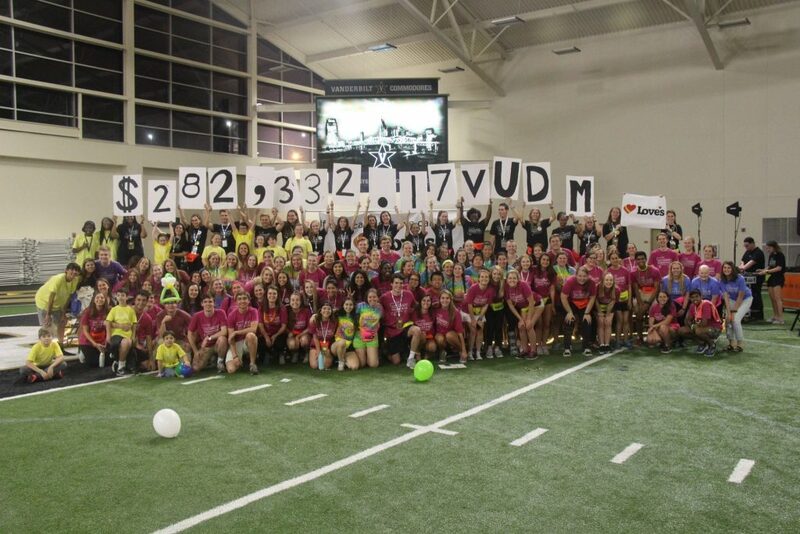 There are many philanthropic organizations on campus, but I believe VUDM is unique in that Dance Marathon is a movement that doesn’t just ask for donations and support, but it inspires students to give back and to want to support. The idea that, year after year, a group of 18-­‐22 year olds come together and work diligently to raise staggering amounts of money for CMN Hospitals is something that I find so powerful and moving. As a college student, there are a lot of things that take up time in my day: academics, relationships with peers, internship and job searches, etc. But I participate in Dance Marathon because no grade on an exam is quite as rewarding as seeing the joy that our program brings to families at Monroe Carell Jr. Children’s Hospital. And while I hope to be fortunate enough to never need Monroe Carell when I have children of my own, I know that if I do, they will be supported and loved from afar by students involved with Vanderbilt Dance Marathon. As one of our Miracle Families said, “You certainly don’t plan on it [your child being hospitalized], you can never be prepared for it, but thank God we had Vanderbilt to help us get through it.” I participate in Dance Marathon so that more families have that kind of positive experience in what is often a challenging and exhausting time. I would imagine that the Dance Marathon program is different on every campus, but I know one thing that surely stays the same is the inspiration that students find through the families and patients that they meet through DM. Not everyone joins Dance Marathon for the kids, but the experience of working together with your peers toward a goal that is so much larger than you, than your MNDM program, and than your university is such a rewarding experience. As I have mentioned, the list of skills I have developed during my time with Dance Marathon span across so many fields: branding, communication, stewardship, supporting families, and much more. Dance Marathon provides students with opportunities to incredibly inspirational people—other students that are passionate about supporting CMN and some of the strongest and most inspiring families in their community. While there are many ways for people to support their community and give back, I think donating to your local Children’s Miracle Network Hospital is one of the most impactful ways to give to your community. Your donation will impact children and families that you may never meet. Not only does a donation to your local Children’s Miracle Network hospital help with patients’ treatments, but CMN hospitals also support families as a whole and care for parents and siblings. Hospitalization of a child affects the whole family unit, and CMN Hospitals treat the whole family. As one of our VUDM Miracle Moms said, “I see the bond between my kids, and I always go back and say thank you because it was the hospital that did it…. it’s not just for the patients. It’s for the whole family.” A small donation to Children’s Miracle Network Hospitals can go a long way and make a profound difference in the life of a child. I believe every child deserves a true childhood, and CMN Hospitals work to give kids their childhoods back. Vanderbilt University’s 2017 fundraising total.